It’s almost a month into summer break, and as the only cook in the house I’ve learned one thing : I NEED a meal plan! See, during the school year we only have the kids every other weekend and every thursday. Usually I just find a way to make it through, throwing “this and that” together on the fly, or at best, only planning for the next 24 hours. Well now….with the kids here for a week at a time during the summer that plan of “cooking on the fly” hasn’t been working so well for me, to say the least. This week my husband wanted Pho soup (it’s hot out, but what does that matter, right?? ), which means that a roast is also thawed. We never use the whole thing to go with the Pho, so I had at least 1/2 of it left. Thinking ahead for once, I was trying to figure out what I could make that would freeze well, as the kids don’t come for another few days. Then I remembered them mentioning Beef Stew, which I’ve never made before, but I’m willing to try as long as the recipe is simple. My go-to site is always Food.com, and that’s where I found this recipe for beef stew. I read thru some of the reviews and of course made a couple changes, as I can NEVER follow a recipe exactly as written…yes, I’m one of THOSE people. 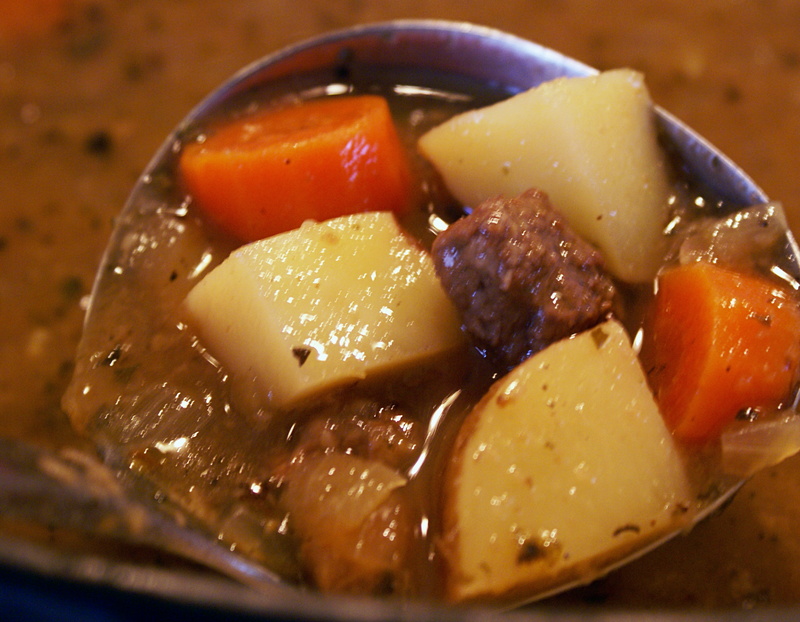 This turned out to be very tasty, and more on the brothy-soupy side as far as Beef Stews go. Meaning, there is almost as much liquid as there is meat & veggies. This would be perfect with my favorite 5 minute Artisan bread, which I’ll make for the kids to round out the meal. And hey, if you do have left over broth at the end just turn it into a gravy to go with mashed potatoes, that will be DELICIOUS. Now I’m kinda hoping there will be some broth left! 1. Heat oil over medium/medium low heat in a large dutch oven. 2. Meanwhile, put flour, salt and pepper in a large ziploc bag, shake to blend. Then place meat in the bag and shake until all the beef well is coated, there will be extra flour in the bag (keep that). 3. Shake off the extra flour from the meat pieces and then add them to the oil, stirring until slightly browned. 4. Add to the dutch oven the remaining flour from the bag and the finely chopped onion, stir well and allow to cook for a 5-7 minutes. Check on it a couple times to re-stir and make sure nothing burns. 5. Add in all of the remaining ingredients EXCEPT the potatoes. Cover and simmer over low heat for 35-40 minutes. 6. Then add in the potatoes and cook for another 35-40 minutes or until they are just getting tender. Turn off the heat and let it “rest” for 5-10 minutes, the potatoes will finish cooking in this time. 7. Adjust salt level as needed. The brand of beef broth I used was a little on the salty side, so I added in another 1/2-3/4 cups of water at the end and it was perfect. That sounds and looks delish!! I have to do meal plans in our house. It helps me stay on task and on budget. I am going to make this stew tomorrow! I have everything except the beef, thanks for the recipe.